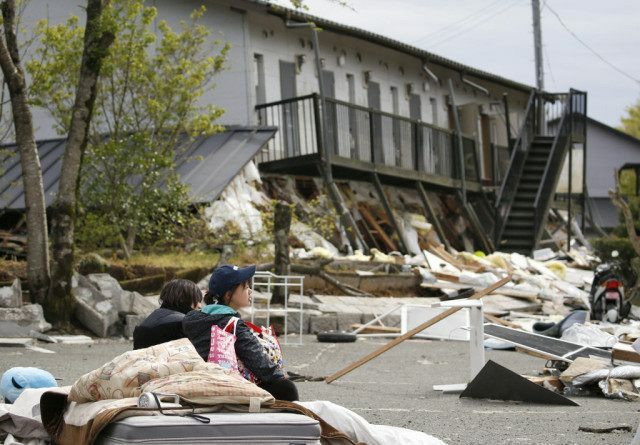 MASHIKI, Japan (AP) — Army troops and other rescuers rushed Saturday to try to reach scores of trapped residents after a pair of strong earthquakes in southwestern Japan killed at least 41 people, injured about 1,500 and left hundreds of thousands without electricity or water. Rain was forecast to pound the area overnight, threatening to further complicate the relief operation and set off more mudslides in isolated rural towns, where people were waiting to be rescued from collapsed homes. Police in Kumamoto prefecture said Saturday night that 32 people had died in the magnitude-7.3 quake and aftershocks that shook the Kumamoto region on the southwestern island of Kyushu early Saturday. Nine died in a magnitude-6.5 quake that hit the same area Thursday night. Four people were missing in Minamiaso, Japan’s Kyodo news agency reported. The village near Mount Aso volcano appears to have been the hardest hit by the second earthquake. Japanese media reported that nearly 200,000 homes were without electricity. TV video showed people huddled in blankets, sitting or lying shoulder-to-shoulder on the floors of evacuation centers. An estimated 400,000 households were without running water. Hundreds of people lined up for rations at shelters before nightfall, bracing for the rain and strong winds that were expected. Local stores quickly ran out of stock and shuttered their doors, and people said they were worried about running out of food. “I could hear the noise of all my dishes come crashing down, the rattling, and I was shocked and sad, now I’ve lost all my dishes,” said Ayuko Sakamoto, who was among those in line for the food. Chief Cabinet Secretary Yoshihide Suga said that 1,500 people had been injured in the quakes. Kumamoto prefectural official Riho Tajima said that 184 were injured seriously, and that more than 91,000 had been evacuated from their homes. More than 200 homes and other buildings were either destroyed or damaged, she said. Prime Minister Shinzo Abe expressed concern about secondary disasters, given the forecast for rain and strong winds. With the soil already loosened by the quakes, rainfall can set off mudslides. “Daytime today is the big test” for rescue efforts, Abe said early Saturday. Landslides have already cut off roads and destroyed bridges, slowing down rescuers. Police received reports of 97 cases of people trapped or buried under collapsed buildings, while 10 people were caught in landslides in three municipalities in the prefecture, Kyodo reported. TV video showed a collapsed student dormitory at Aso city’s Tokai University that was originally two floors, but now looked like a single-story building. A witness said he heard a cry for help from the rubble. Two students were reported to have died there. In the town of Mashiki, where people were trapped beneath the rubble for hours, an unconscious 93-year-old woman, Yumiko Yamauchi, was dragged out from the debris of her home and taken by ambulance to a hospital. Her son-in-law Tatsuhiko Sakata said she had refused to move to shelter with him after the first quake Thursday. “When I came to see her last night, I was asking her: ‘Mother? I’m here! Do you remember me? Do you remember my face?’ She replied with a huge smile filled with joy. A kind of smile that I would never forget. And that was the last I saw of her,” Sakata said. The area has been rocked by aftershocks, including the strongest with a magnitude of 5.4 Saturday morning. The Japan Meteorological Agency said that the magnitude-7.3 quake early Saturday may have been the main one, with one from Thursday night a precursor. David Rothery, professor of planetary geosciences at The Open University in Britain, said the Saturday morning quake was 30 times more powerful than the one Thursday night. “It is unusual but not unprecedented for a larger and more damaging earthquake to follow what was taken to be ‘the main event,'” he said. Rothery noted that in March 2011, a magnitude-7.2 earthquake in northern Japan was followed two days later by a magnitude-9.0 quake that caused a devastating tsunami. “Fortunately, this time the epicenters have been below land rather than under the sea, and no tsunamis have been triggered,” he said. The epicenters of Thursday’s and Saturday’s quakes were relatively shallow — about 10 kilometers (6 miles) — and close to the surface, resulting in more severe shaking and damage. National broadcaster NHK said as many as eight quakes were being felt an hour in the area. One massive landslide tore open a mountainside in Kumamoto’s Minamiaso village all the way from the top to a highway below. Another gnawed at a highway, collapsing a house that fell down a ravine and smashed at the bottom. In another part of the village, houses were left hanging precariously at the edge of a huge hole cut open in the earth. Suga, the chief Cabinet secretary, told reporters that the number of troops in the area was being raised to 20,000, while additional police and firefighters were also on the way. At a hot springs resort, dozens of people trapped were picked up by military helicopters, Asahi TV reported. Kyushu island’s Mount Aso, the largest active volcano in Japan, erupted for the first time in a month, sending smoke rising about 100 meters (328 feet) into the air, but no damage was reported. It was not immediately clear whether there was a link between the quakes and the eruption. The 1,592-meter (5,223-foot) -high mountain is about a 1 1/2-hour drive from the epicenter. The historic Aso Shrine, a picturesque complex near the volcano, was seriously damaged, with a number of buildings with curved tiled roofs flattened on the ground like lopsided fans. A towering gate, known as the “cherry blossom gate” because of its grandeur, especially during spring, collapsed. The Nuclear Regulation Authority reported no abnormalities at Kyushu’s Sendai nuclear plant. Yamaguchi reported from Tokyo. Associated Press writers Yuri Kageyama in Tokyo and Danica Kirka in London contributed to this report.